Marvel Studios boss Kevin Feige expects to acquire the X-Men and Fantastic Four franchises very soon. The fine details of the Disney and Fox merger are still being ironed out, but it looks like it's pretty much a done deal at the moment. Feige has been tight-lipped about the situation in the past, but he seems to be pretty sure about the deal now and he's eager to get to work in bringing the franchises back to where they belong. 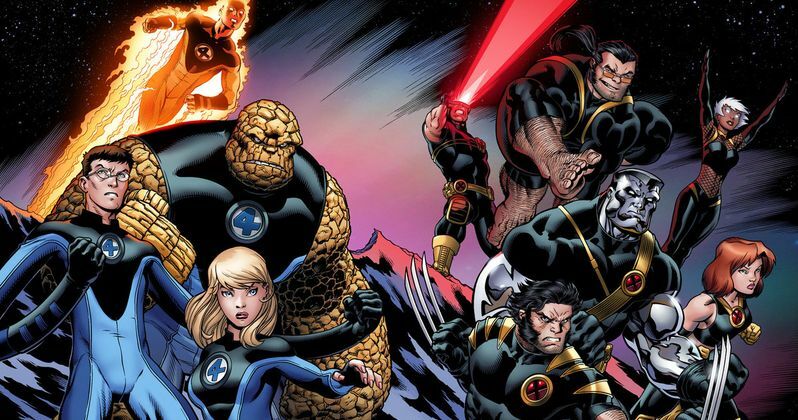 In a new interview, Kevin Feige was asked about the X-Men and Fantastic Four joining up with the Marvel Cinematic Universe. The Marvel Studios boss has previously talked about the excitement of potentially bringing the characters back under the Marvel umbrella. However, when asked if Marvel had already regained the rights to the Fox franchises, he had this to say. "No but we've been told it's looking very, very good and could happen in the first six months of next year." This is the most that Kevin Feige has talked about the specifics of the Disney and Fox deal, which means that things are more than likely looking to be finalized sooner than later. With that being said, it's unlikely that we will see the X-Men and Fantastic Four or even the Merc with a Mouth join the MCU right away. But, that means that the studio can now start to plan out their strategy for the next handful of years, including movies that they want to make, scripts, and casts before even officially acquiring the rights. This should come as pretty exciting news for MCU fans who have been waiting to hear how everything will work when the ink is dry. The X-Men franchise started in 2000 and is often credited for starting the superhero success that is currently happening. MCU fans have been waiting to see those characters interact with the rest of the Marvel stable for years. As for the Fantastic Four franchise, many are just hoping to get a proper movie made to erase the previous movies that have come out. If anybody can take both franchises and turn them around, it's Kevin Feige. The MCU is seeing massive returns after starting up in 2007. Deadpool has been a smash success for Fox, but it's unknown how Disney and Marvel will treat the Merc with a Mouth. We should get some official word from Disney and Fox in the next handful of months, but it looks like we're all one giant step closer to seeing Marvel retain its Fox characters. For now, the MCU is set to release Captain Marvel in March, Avengers: Endgame in April, and Spider-Man: Far From Home in July. Fox's X-Men: Dark Phoenix opens up in June, which is a safe distance from the Avengers and Spider-Man. Now we're going to have to see how Marvel ends up taking on the Deadpool franchise. You can head over to Variety to check out the rest of the interview with Kevin Feige.